A “full-on Formula 1 kind of race” on the surface of the Moon is to be held as soon as next year. Private rovers will fight to grab the Google Lunar XPRIZE of $30 million. Two companies leading in the competition – the Pittsburgh-based Astrobotic and Japanese rover-developer HAKUTO – have agreed to simultaneously release their rovers. The expect both machines to land on the Moon's surface at the same time. "Once all the rovers are released and everyone's turned on and initiated...we'll line the rovers up, and then the green flag will go up, and the race is on. It'll be like a full-on Formula One kind of race on the surface of the moon,” John Thornton, head of Astrobotic, told Popular Mechanics. To win the $30 million prize, the teams must land a rover safely on the Moon, move it 500 meters on the Moon’s surface, and send back a video in HD quality. 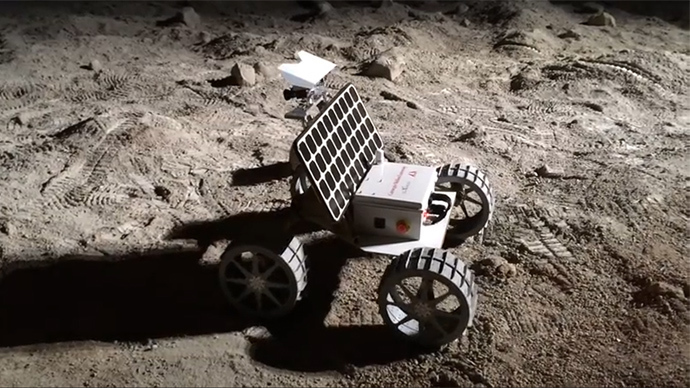 Between the two companies, three rovers are being sent to the Moon – Astrobotic’s Andy and HAKUTO’s Moonraker and Tetris. They will be competing against each other, as well as against another 16 teams taking part in the race. The engineers are comparing the race to NASCAR and Formula 1, though the maximal speed will be much lower. For instance, Andy’s speed is seven inches (17.78 cm) per second. The rovers will communicate with the spacecraft, which will transmit the data back to the Earth. The main aim of the rovers is surface exploration and to search for caves that could become bases for humans on the Moon in the future. “Our goal is to successfully create a commercial capability to fly and deliver payload to the moon,” Thornton said. “We will have achieved that goal whether we have some of the winnings of the prize, or a lot of the winnings of the prize, or maybe none of the winnings of the prize." The race is planned for the second half of 2016, and is set to end on December 31 of next year. "We will secure a launch vehicle when we have all the payloads booked," Thornton said. "What we don't want to do is get in a scenario where we secure the launch too quickly and we burn funds and run out of runway." The partnership between Astrobotic and Hakuto will allow both teams to share the cost of flying to the moon atop the SpaceX Falcon 9 rocket. However, a contract has not yet been signed. The teams have agreed to share the prize money if one of them wins. The agreement seems to be useful for both parties; HAKUTO is focusing on rover development, while Astrobotic is working on both a lander and a rover. "We decided not to develop a lander," HAKUTO’s Takeshi Hakamada said. "We have to choose a lander. The reason why we chose Astrobotic is partly that we are planning to explore the lunar caves, the skylights. Astrobotic also has a plan to land close to a skylight." The agreement of the two companies has not been a problem for the race organizers. “It still meets our goals,” said Andrew Barton, director of technical operations for XPRIZE. Meanwhile, Astrobotic insists the prize money isn't the most important element. The Google XPRIZE was first announced in 2007. The prize fund consists of the first place prize of $20 million, the second of $5 million, and several additional prizes totaling $5 million. If any government takes part in the project with more than 10 percent participation, the first prize will be only $15 million.